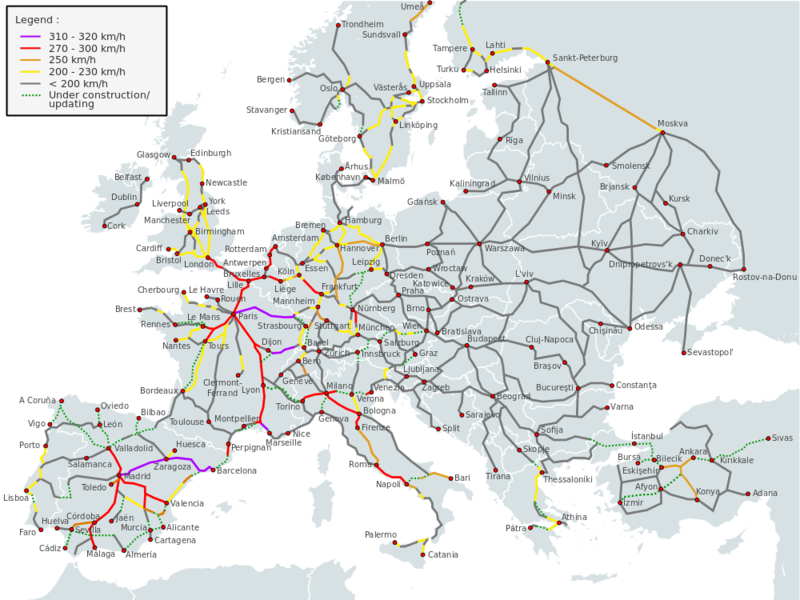 Railway history has demonstrated the corporate fascination with speed and the development of high-speed networks across Europe, including the proposed HS2 addition to HS1 in Britain, illustrate a prevailing theme. One interesting question – which is the world’s fastest railway locomotive? Some will consider the general subject of trains and might relate to the romance of steam and say “Mallard”. Some will likely consider more contemporary examples and suggest the French SNCF ATGVs, the German ICE trains, or the Japanese (Shinkansen) “Bullet” trains – all three being high speed electric train sets. Similar developments have occurred on the Spanish and Italian systems. Further afield, a candidate could be the bullet-shaped Chinese electric-powered train engine called “Lanjian” (“Blue Arrow”); built in September 2005, as one of China’s key research programs, and having a maximum speed of 305 km/h. In Britain, the records will show that the fastest steam locomotive was indeed LNER Gresley A4 Pacific locomotive 4468, “Mallard”; the loco achieved 126 mph (202.6 km/h) on 3 July, 1938. Almost 50 years later, on November 1, 1987, the Class 43 HST (InterCity 125 train) also became the current confirmed record holder – as the fastest diesel-powered train – at 148 mph (238 km/h). More recently, a Eurostar electric train set was used to create a new British rail speed record of 208 mph (334.7 km/h), on 30 July 2003. But what of the efforts by other countries? On 29 March 1955, BB 9004 “Jeumont-Schneider”, a DC electric loco pulling 3 cars, achieved a speed of 331 km/h (206 mph) on the line “Les Landes” between Bordeaux and Dax, France. Then, on 7 December, 1979, a Japanese Class 961, Shinkansen AC electric train, reached 319 km/h (198 mph) on the Oyama test track – now part of Tohoku Shinkansen. Again, more recently, on 1 May 1988, a German Inter City Experimental (ICE-V) AC electric train set reached 406.9 km/h (253 mph) on the high speed line between Hanover and Würzburg. So, significant improvements in design, technology and speed. However, the question posed at the outset was qualified by the term fastest locomotive and not train – so, the fastest conventional railway locomotive is the multi-system electric 1216 050-5; a type ES 64 U4 member of the Eurosprinter design, built by Siemens. The locomotive, owned by Austrian Federal Railways (ÖBB), is referred to as a member of the “Taurus” family of the OBB locomotive fleet. For the record, the locomotive was driven by Alex Dworaczek from Munich, on the high speed Ingolstadt to Nuremberg line, between Kinding and Allersberg, on September 2, 2006. The locomotive, capable of developing 8,660 hp and subsequently adorned with the crest of “Kinding” and a Vmax357 branded logo, reached a speed of 357.0 km/h (221.82 mph). ÖBB multi-system electric 1216 050-5; built by Siemens and a type ES 64 U4 member of the Eurosprinter design. The locomotive presents an outstanding design and, as seen, was emblazoned with logos of the companies that participated in the design and build. This striking style has been excellently modelled by Roco and includes all the visual features of the prototype – as shown below. A model of the ÖBB Vmax 357, loco 1216 050-5 – made by Roco. Finally, to recognise the ultimate speed performance, the official world record, for a conventional train, is held by the French SNCF TGV (Train à Grande Vitesse). On 3 April 2007, specially tuned electric AC TGV POS (Paris-Ostfrankreich-Süddeutschland – German for Paris, Eastern France, Southern Germany) set 4402, reached 574.8 km/h (357.2 mph). For the record attempt, it was reduced to three cars and supplied with higher voltage. If you are interested, a useful analysis of railway speed records can be found on Wikipedia.